Our primary goal is to introduce you to beautiful, interesting places. Routes include architectural gems, amazing views and scenic parks and gardens. The routes avoid busy tourist sites; only rarely do they take you to their vicinity. Our mission is to show you the less well-known, but all the more interesting side of our city. You don't need to be an expert in Czech history to enjoy the walks. They are the type of walks locals would take with friends or family. Get to see Prague beyond the best-known sights! Our scenic walks will take you to interesting neighbourhoods that are anything but touristy. Pick up your free copy at any of our information centres, order from our e-shop (you pay only for shipping & handling) or simply dowload it here. 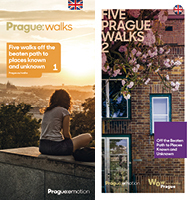 Extended version of our popular walks alongside other guided tours are available in SmartGuide app. 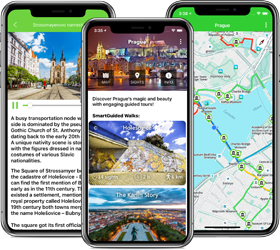 Full city map, audio narratives, Augmented Reality navigation and offline mode for your convenience on the go. Not big on walking alone? Our professional guides will provide insight and context to everything you'll see along the walk.